It's even prettier than I imagined! Isn't it great? It's a million colors, all of them honey-ish. And this was the bargain glass mosaic tile! Not the expensive stuff. Eeeeeee! It's starting to be a bathroom! Guh! *wants to run away with and marry your bathroom* This is so damned exciting!!!! Hee! I know! Now we're to the point where every day brings interesting new developments visible to the naked eye. Not just 2x4s and insulation, you know? Stuff girls can see. Thanks! I almost couldn't resist pulling off the masking paper so I could see how the tile looks with the pebbles. omg! that looks awesome! are those tiny individual tiles or larger squares? 'cause that there is a freaking time consuming job and it's looking gorgeous! They're little tiles attached to netting in larger squares. Otherwise, you'd have to hire a Byzantine crafstman, I think, to install them. Can hardly wait to see it all finished myself, but seeing these tiles up has finally brought the project to life for me. Now I'm really, really eager to have it finished. Now I'm picturing the space filled with fragrant steam, and me in there sloughing off the cares of the day. 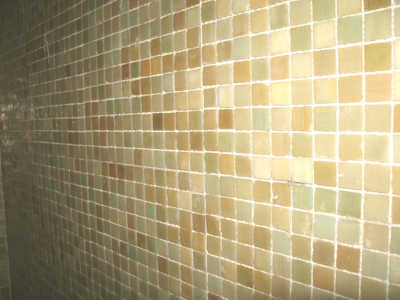 *admires* I love the warm colors of the tile. It's so exciting to see the latest changes and imagine how the finished room will look. You are seriously winning at home improvement with this project. Oh my dear, it's going to be so beautiful! What lovely colors--I'm all excited for you! Thank you! I wanted it all lavender and gray, and my designers wisely talked me into something a little warmer. It was the off-white pebbles that tipped me. I wanted them sooooo badly, and that meant switching all my other color preferences to warm. Hee! I hear there's a bit of anti-freeze in the chemical soup they put in those portapotties. But no--I've been stopping home in the evenings just long enough for a bout of wireless broadband, but not long enough to need the loo. Then I've been commuting to my mom's in Vancouver. The work will be done next week. *sigh* I can hardly wait! Yeah - it looks absolutely fabulous!!!! Anne, It is beautiful, I enjoyed reading your blog - actually my 1st ever! I can't wait to see it complete (neither can you of course). I'll bring champagne. It is all looking SO wonderful! I can hardly wait to step on the floor and touch the tiles! Yummy colors, yummy textures, yummy to the eye. How much better can it get? Oh, wait, it could probably include hot and cold running water and a toilet.... I forgot.... But they will be along soon I'm sure! Great progress!!! The glass tiles are wonderfully tactile! Obviously, so are the pebbles. I hadn't quite realized how much texture this set of finishes was going to have. I stopped home at lunchtime today to give Ed a check, and things are starting to look pretty complete. The switch and outlet boxes have been screwed down (no more wires hanging out of the walls), the dusty mess is all cleaned up, the stones and glass tiles are all in and he'd started grouting. This weekend, I expect to prime and paint the pocket door. 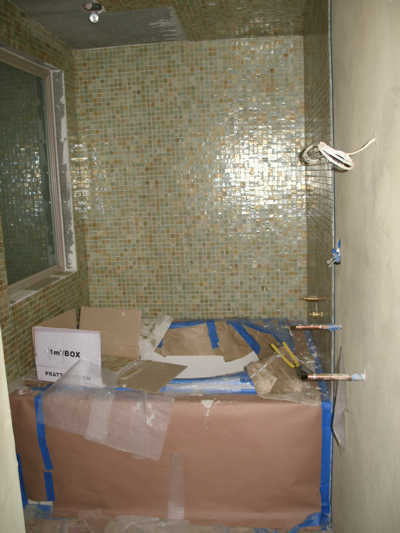 He's going to get the sink mounted--and, presumably, the faucets and showerhead--early in the week, as soon as the grout is set. So, we're very near the finish line now!